Profiled galvanised sheet steel platform, which is corrosion resistant. 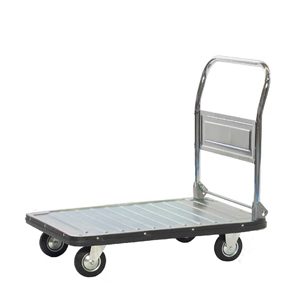 This galvanised sheet steel platform truck is made of corrosion resistant materials and is a strong and long lasting solution for the movement of heavy and awkward items around the factory, warehouse or other large indoor area. A PVC bumper strip around the edge of the platform ensures that neither the trolley nor anything else it comes into contact with should be damaged in any way. 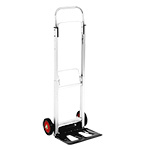 Its shiny chrome handle folds out to a height of 860mm, and securely locks into place, enabling the operator to easily push or pull the truck and its load, whilst adhering to health and safety standards. This truck has an effective platform base of 800mm by 570mm, and weighs in at 25kg, making it neither too large nor too small for most carrying jobs in a large work environment. It takes a maximum load capacity of 300kg, making it a convenient all in one way of transporting large, awkward or multiple items from one location to another. The four castor wheels turn smoothly, and consist of two that swivel and two that follow. 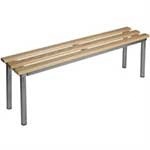 This allows for ease of steering and movement, even when loaded. 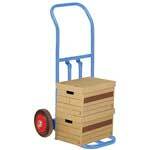 This truck is delivered with the wheels loose, but they are easy to bolt on to the unit before use.